Professor Frebel's research interests broadly cover the chemical and physical conditions of the early Universe, and how old, metal-deficient stars can be used to obtain constraints on the first stars and initial mass function, supernova yields and stellar nucleosynthesis. She is best known for her discoveries and subsequent spectroscopic analyses of the most metal-poor stars and how these stars can be employed to uncover information about the early Universe. By now, she has expanded her work to include observations of faint stars in the least luminous dwarf galaxies to obtained a more comprehensive view of how the Milky Way with its extended stellar halo formed. She carries out her observational research on old stars using the 6.5m Magellan telescopes in Chile through high-resolution optical spectroscopy. Recently, Professor Frebel also started a large supercomputing project to simulate the formation and evolution of large galaxies like the Milky Way in a cosmological context. The N-body dark matter halos will ultimately help her trace the cosmological path of the oldest stars from their birth in the early universe until their arrival in the Milky Way halo through various merger events. This huge data set will also enable to quantify the breadth of galaxy formation and the abundance of substructure of large galaxies, among many other things. After studying physics in Germany, Frebel received her PhD from the Australian National University's Mt. Stromlo Observatory in 2007, advised by Prof. John E. Norris. 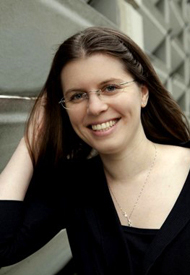 For her work on "Abundance Analysis of Bright Metal-Poor Stars from the 'Hamburg/ESO Survey", Frebel was awarded the 2007 Charlene Heisler Prize (for the best Australian astronomy PhD thesis). She then received the WJ McDonald Postdoctoral Fellowship which took her to Austin, TX (2006-2008) before taking up the Clay Postdoctoral Fellowship at the Harvard-Smithsonian Center for Astrophysics in early 2009. She was awarded the 2009 Ludwig-Biermann young astronomer award of the German Astronomical Society as well as the 2010 Annie Jump Cannon Award of the American Astronomical Society. In early 2012, Dr. Frebel joined the MIT physics faculty as Assistant Professor, and she won a 2013 NSF CAREER award. Dr. Frebel was promoted to Associate Professor of Physics with tenure in 2017. Professor Frebel's publications can be found on inSPIRE.